Survival Warehouse ships most orders by UPS. Very small parcels or those with a value under $99.99 may be shipped USPS. You will receive tracking information when your online order has shipped. Orders shipping to Alaska, Hawaii, and Canada will be charged the actual cost of shipping. You will be contacted for approval of actual charges before your order is processed. Orders for in stock items are processed and leave our warehouse within 3 business days. If your order includes an out of stock item, you will be contacted regarding shipping times and options. As a rule all orders ship complete. Partial shipments are made at the sole discretion of our staff. 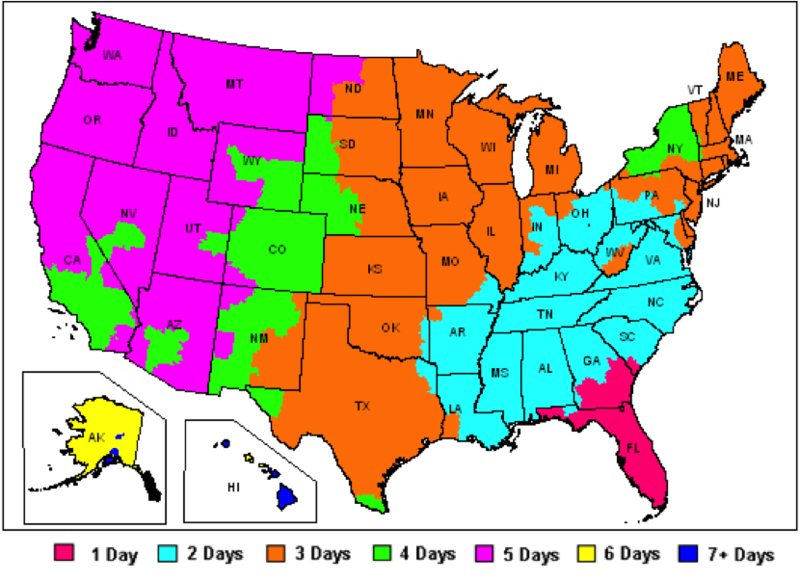 Please see the charts below for standard shipping times via UPS Ground services. Please add 2 business days processing time to these ship times to calculate your estimated delivery date. Survival Warehouse cannot guarantee delivery times on behalf of our shipping partners. For specific information on the delivery of your order please contact the appropriate service provider with your tracking information. Survival Warehouse offers FREE ground shipping for all orders over $99.00 shipped to an address within the continental United States. Qualifying orders will not be charged shipping at checkout. If your order does not qualify for free shipping or you are placing an order from outside the continental United States, shipping and handling charges will apply. Please see below to determine the cost of shipping to your location. As the purchaser, you are solely liable for any and all taxes, duties and/or fees associated with cross-border shipments. Our shipping prices do not include taxes, duties, or fees associated with international shipping. **Please note: We are unable to ship to addresses outside of the USA and Canada. My Package Is Missing. What Do I Do? File a police report for stolen goods. Email your police report to admin@survival-warehouse.com or fax your police report to (407)349-2523. We will use your report to file a claim with the shipping company. Once the shipping company completes the claim (within 5 days) we will ship you a replacement order. Please be sure to check with your neighbors or anyone else who may have accepted the shipment for you prior to filing a police report. Deliveries that are refused or returned to us as “undeliverable” will be refunded in full minus the cost of shipping. We reserve the right to charge a 15% restocking fee on a case-by-case basis.